Illinois is the only state in the country that denies all rights to carry arms. When I arrived there this week, however, I felt like I was free compared to the District. 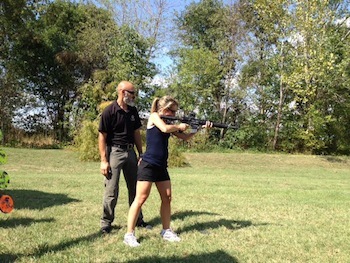 To get better at shooting, I took a ladies self-defense training course taught by Rob Pincus at the Winchester Ammunition in the Prairie State. With my gun in a locked box, I was able to take it from the St. Louis airport to the hotel in Collinsville and the two shooting ranges. In Washington, I can only legally have my gun in my home. A visitor to the nation’s capital could not bring a gun to train because it’s always illegal to possess an unregistered gun in Washington. Also, there are no shooting ranges in D.C. because the city uses zoning to make it effectively impossible to open one. Beginning on Monday, we shot at Nilo farms, which is private property owned by Winchester. That’s something else that can’t be done back home in the District because it’s always illegal to discharge a firearm. Both ranges we went to were outside, something I’d never done before, and is much more enjoyable than shooting at a gun range inside. Mr. Pincus teaches a type of training he calls “intuitive” and “efficient”, which is part of his Combat Focus program. His philosophy is that standing in a shooting range, in a controlled situation, trying to perfectly shoot inside a target center is not useful for self-defense training. He calls crimes “ambush situations” because you are taken by surprise and need to act smoothly under an uncontrolled, high-stress situation. The first thing he told us to do was to stop looking through the sights of the gun. Mr. Pincus said 86 percent of self-defense shootings were within nine to fifteen feet. There was no point in wasting time looking through sights when most of his thousands of students can hit center mass on the target (i.e. the bad guy in the chest) at that distance without them. After we got used to shooting at eye level and only looking at the target, he changed things again by having us move a step laterally before we shot on command. I realized quickly that standing inert at a shooting range made it much easier to focus and aim than a realistic scenario in which a person was moving in a crime. The side step is also a quick self-defense maneuver if someone is shooting at you. The next drill was to keep our gun moving in a circle or figure eight while shooting so that we were forced to learn to pull the trigger smoothly during a dynamic situation. Jerking the trigger is one of my biggest challenges, so this forced me to focus on that skill. 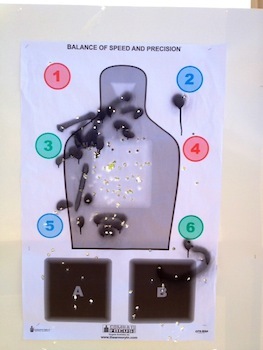 The next level was to train to use the sighs to try to hit small numbered circles on the targets. I never got inside a single one, which was frustrating. Mr. Pincus assured me that it was more important for self-defense that I could always shoot the center of the target without using sights. However, by the time we had a team competition late in the day and had to shoot out all the numbers as fast as possible, I nailed one through five with ten rounds. I was excited to have made so much progress. The training guru then gave us each a holster to learn how to quickly remove the gun and shoot. Since D.C. does not have any carry rights, I have no use for holstering a gun now, but this skill will come in handy whenever the city council decides to recognize my constitutional right to bear arms. One day we shot at a public range using firearms that are illegal in Washington — AR15-style rifles in .223 and .308 caliber. Mr. Pincus would not let us use the red dot scope to aim in short distances, which proved much more difficult to do than pistol shooting. Once we had mastered the feel of the rifle, he let us use the scope to shoot at balloons let loose on the ground. It was a very powerful feeling shooting the big gun. We used the .308 on a table to steady it to shoot a steel target 100 yards away. I’d gotten so used to movement that this seemed much less satisfying. Lastly, we were challenged to a real-world scenario. We had to run across the field to a lock box, put a full magazine into the gun, while pretending to call 911 with a cell phone. Mr. Pincus changed things for each person’s turn in order to make the situation as high stress as possible. On my turn, he had one of the other women be the 911 operator instead of him giving orders. I gave her my address and the scenario of the imagined crime. Then Mr. Pincus yelled for me to fire. I dropped the phone, aimed at the target and hit four directly in the center of center mass. My trainer was impressed, saying it was the best I’d shot in two days. I told him I was imagining a possible alternative scenario to the situation that pushed me to get a gun, which was a home invasion. I imagined the bad guys coming back at night and banging down the bedroom door to attack me. It was the anger and fear from a real-life situation that helped me focus enough to stop flinching and jerking the trigger. Washington Mayor Vincent Gray believes it’s “irresponsible” for people to get proper training on guns. He’s dead wrong. I shot a gun for the first time in my life last October and have only owned my 9mm Sig Sauer since February. I’m an amateur, but I have an enormous responsibility as a gun owner to know how to safely operate my firearm so there are no accidents. It took going to the state with the most restrictive gun-control laws in the country to see how dangerous Washington is with its anti-safety chief executive. Videos of me shooting at the training are below. 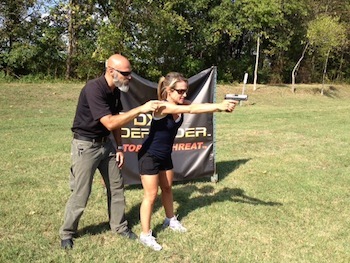 The first is day one learning the fundamentals of intuitive defensive shooting using a Smith and Wesson M&P in 9mm. The next shows me learning how to use a holster with my own Sig. The third one is me shooting the AR15 rifle at balloons on the ground. Emily Miller is a senior editor for the Opinion pages at The Washington Times. Her “Emily Gets Her Gun” series on the District’s gun laws won the 2012 Clark Mollenhoff Award for Investigative Reporting from the Institute on Political Journalism.You can also follow her on Twitter and Facebook.